The solar eclipse due to cover much of Europe on March 20 will be the continent’s first for 16 years. Back in 1999, as people stopped staring at the sun and got back on with their day they caused a power surge which still stands as a UK record – greater than anything after a football match or royal wedding. At the time, solar power made up just 0.1% of all Europe’s electricity produced from renewables. Since then it has increased to at least 5% as countries subsidise renewables to meet EU targets. The installed capacity of solar power in continental Europe is expected to reach 90 GW this year, comparable to 150 coal fired plants. Under clear skies, regulators expect some 35 GW of solar energy to fade away with the eclipse before being re-injected into Europe’s electrical system. This is a big test for solar power. It’s the first time when such an event could have a significant impact on those European countries with lots of solar panels such as Germany (with 44% of continental Europe’s installed capacity), Italy, Spain and France. 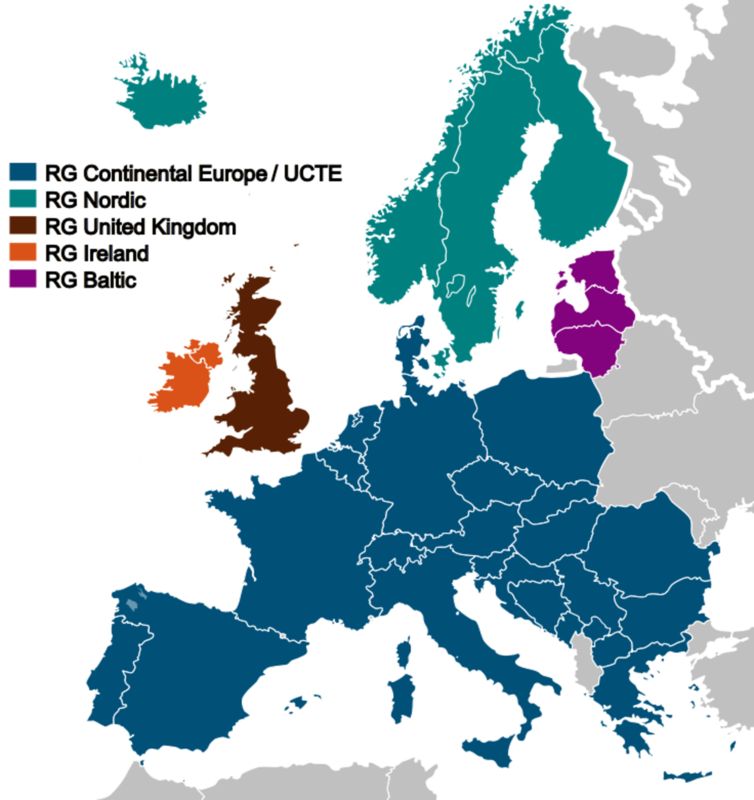 Much more, European grid integration means everyone could be affected. Keeping the grid stable during the eclipse is the main concern for power utilities. The electrical grids of continental Europe are linked together in what’s called the European synchronous area, allowing countries to juggle excess energy between them to meet demand. Grid regulators will have to coordinate across regions to manage the solar drop off along and demand, all in real time. Europe’s solar superpowers are all part of the same big grid. According to ENTSOE, Europe’s association of national grid operators, around 50% of the lost power will come from Germany and 21% from Italy. The grid will be losing 0.4 GW/minute at the start of the eclipse and gaining 0.7 GW/minute as the sun returns. This is a huge amount of electricity generation to come online at once. The European power system will need to adapt in real time, with countries helping each other by providing the necessary reserves of coal, gas and hydropower to keep things running. Electric grids operate on the principle that demand and supply need to be carefully balanced. In continental Europe, grids are connected as one synchronous network. The normal operating frequency is 50 Hz, with two statutory limits, the upper limit, which is 50.5 and the lower limit which is 49.5. Above the upper limit, the generators will trip, while below the lower limit demand will disconnect completely, that means power won’t reach end users and blackouts will happen. 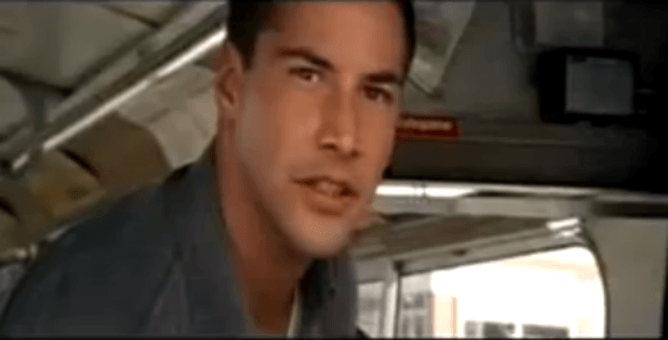 Don’t drop below 50, Keanu. Think of it like driving a car with a target speed of 50 miles/hr (+/-0.5mph). The accelerator is generation, the forces dragging on the car represent the demand. Keeping the frequency at 50Hz means maintaining secure operation of the system, quality of supply and operate economically. Despite the impact on solar energy the eclipse’s most significant effect on the power grid will actually be as a result of human behaviour. 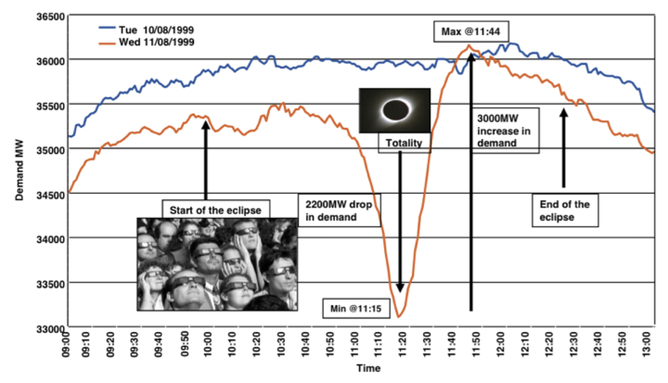 During the 1999 eclipse in the UK, people stopped working to enjoy the phenomenon, as highlighted in this graph by Solar Power Portal. UK power demand during the 1999 eclipse (red) compared with the previous day (blue). The 3 GW surge was greater than the 2.8 GW surge after England played Germany in the 1990 world cup semi-final, or the 2.4 GW surge after the 2011 royal wedding. Something similar will happen this time round. There will be a drop in demand before maximum eclipse, and increased demand after as people come back inside, turn on the tv and fire up the kettle. In this time the system will have to adapt to the changing load and this could be a challenge. Planning is critical, as you can’t just instantly increase electricity generation. But electricity surges happen from time to time – the 2014 World Cup provides a recent example – and grid coordinators have contingency measures in place to balance supply and demand. The solar eclipse on Friday is a good test for the future, when even more electricity will be produced from renewables like solar and wind, which are more volatile and dispersed generation. Germany, Italy and the US are among the countries where solar will make up a large proportion of overall power. In such situations, even cloudy weather will create a big decrease in production. If you want to look at what happened during the eclipse, then BM reports provides near real time and historic data on the UK’s national grid balancing system – electricity generation, system prices, warnings, frequency, wind forecasts, market activity, and so on. So, while most people will spend Friday morning observing at the sun with their pinhole cameras, I’ll be keeping one eye on the grid.